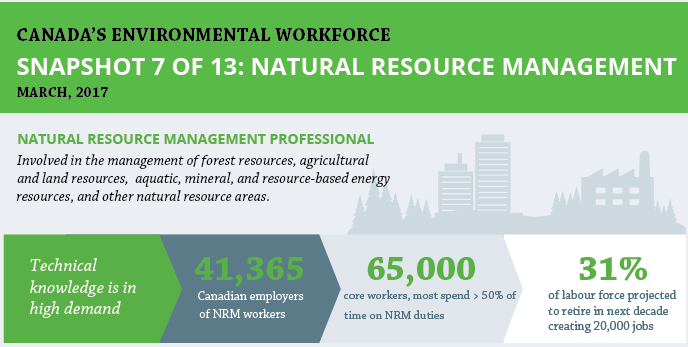 Opportunities for professionals in the Natural Resource Management (NRM) sub-sector are expanding in the near and long terms thanks to the combination of different factors. On the one hand, governments are actively involved in facing environmental challenges; on the other hand, cross-cultural skills are necessary to collaborate with First Nations communities to develop sustainable projects. On top of that, new technologies are offering a different perspective on monitoring and presenting information. First of all, let’s explore the breakdown of NRM core workers, their occupations and what fields they’re employed in. Based on the occupational analysis of job advertisements in this sub-sector, the top occupations are scientists and technicians, accounting for 45% of all the 65,000 core workers in NRM. Scientific professionals and technicians are employed in several fields that span forestry, agronomy, environmental science, ecology, biology, fisheries and wildlife fields, aquatic studies, among others. Job titles for these practitioners extend over functional areas that include environmental planning, policy, regulation, environmental protection roles, research and management. In these jobs, scientists apply their skills and technical knowledge to develop policy and perform environmental impact assessments. Engineers and planners are the second largest group with 21%. For other NRM occupations, 6% work in forestry, 12% work in policy and compliance, 9% in management and other roles, 4% in research and education and 2% in technology-related roles. An aging workforce is one aspect contributing to job significant job creation. In the next decade, 31% of labour force is projected to retire, creating upwards of 20,000 jobs. The sub-sector has a growing need for data management of environmental information. Newer technologies are leading to the creation of detailed information in the forms of databases, imagery and geographic data. This type of data becomes crucial to make decisions on how to protect and manage natural resources. Another important trend is consultation and partnership with indigenous communities. Governments and industry are working together to operate cross-culturally and achieve goals that benefit both businesses and First Nations communities. Technology is also changing the way professionals work. Drones are an excellent example to illustrate how this is happening. Nowadays, they’re being used to monitor remote forest locations, observe wildlife populations and track other operations. An article recently published on CBC suggests that drones and infrared cameras could be game-changers to fight forest fires. Governments around the world, including Canada’s, have shown interest in this technology to work on preventive actions. 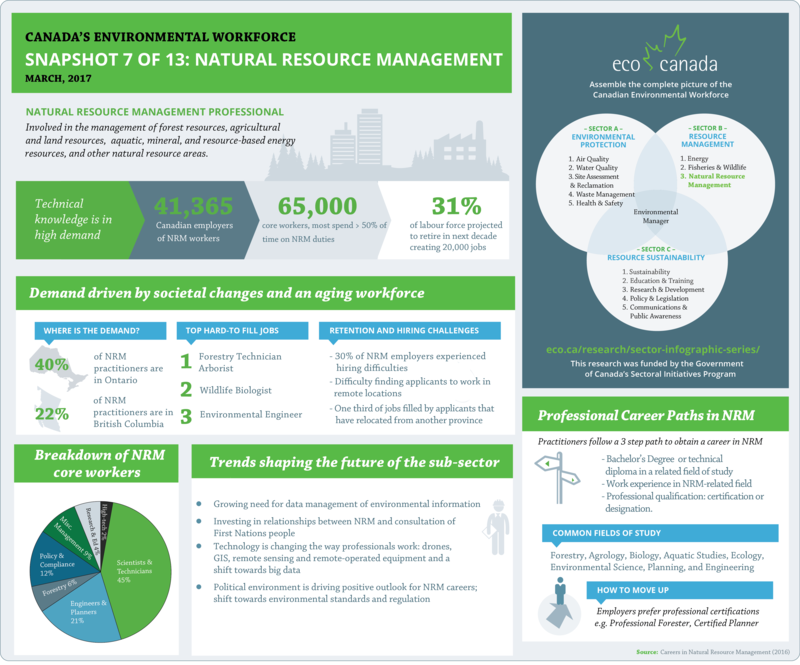 The current political environment is driving positive outlook for careers in this sub-sector because governments are looking to improve the management of resources and increase their environmental protection budgets.